Construction site accidents are an unfortunate but relatively common occurrence in North Carolina. 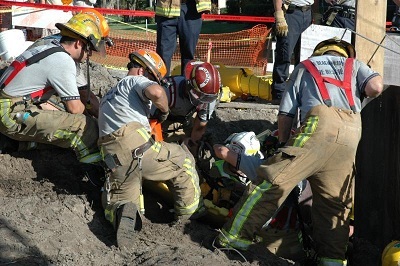 In many of these accidents, the injured party is an employee of one of the contractors. If the employee only suffers minor injuries, he or she will typically only pursue a workers compensation recovery. However, for more devastating injuries and wrongful death claims, the injured party or his or her family should investigate to determine whether there is any “third-party liability,” that is, whether the negligence of anyone other than his or her employer caused the accident. In that case, there are additional damages not available through the workers compensation system – such as pain and suffering. No matter whether you are an employee on the job, or just a visitor or passerby, the Raleigh personal injury attorneys of Maginnis Law can help. To speak with one of our lawyers, call Shawn Howard at 919.480.8526 or Edward Maginnis at 919.526.0450. Construction related injuries may be caused by any number of accidents but some of more common causes include fires, electrocutions, and falling debris. No matter the exact circumstances of your case, if there are serious damages involved, a full investigation of third-party liability should be undertaken. Maginnis Law can help connect you with the appropriate professionals, such as forensic engineers, to perform such an investigation. We can then file suit against the responsible parties and their insurers. An important consideration in cases involving permanently injured workers is the “Workers Compensation lien.” If the Workers Comp insurance company has paid benefits, it will likely try to recover the amounts spent in any suit you file against a responsible third-party. While they will more than likely be awarded some amount from your claim, our attorneys will diligently work to limit their recovery and maximize your net recovery. Maginnis Law provides free consultations to personal injury claimants and family members of wrongful death victim. All such cases are handled on a contingency basis. Neither injury victims nor estates pay any attorneys’ fees until there is a recovery from the at-fault party or its insurance company. If a family member has lost his or her life in a construction accident, or you have personally sustained serious injury, contact the Raleigh civil litigation attorneys of Maginnis Law. You can reach Shawn Howard at 919.480.8526 or Edward Maginnis at 919.526.0450. Both Ed and Shawn regularly represent clients from Raleigh, Cary, Durham, Fayetteville, Chapel Hill, Apex, Morrisville, Wake Forest, and the remainder of the Triangle. For confidential email inquiries sent directly to our attorneys, use the form on our contact page.